Sadly, the hot light sign wasn’t lit, so these weren’t freshly made. My favorite Krispy Kreme donut is the plain glazed kind, and these looked a little over the top for my taste. Because this blog is all about trying new things, we ordered them anyway to see if maybe they were secretly amazing. I was most interested in the Nutter Butter® Cookie Twist donut, so we tried that one first. It’s not filled with anything and has a regular glaze on it. That made it easier to handle the sprinkle of Nutter Butter cookie pieces and all of the sugary peanut butter icing on it. Next up was the Chocolate Chip Cookie donut with a Chips Ahoy!® cookie on top. The opposite to the first one, this donut had no glaze but was filled with cookie dough kreme. I wasn’t able to really make out the cookie dough flavor too much, probably because I was also tasting the dark chocolate topping with the Chips Ahoy! cookie pieces and the mini cookie. This one had a lot going on. Last was the Oreo® Cookies and Creme donut, with no glaze, OREO Cookies and Kreme™ filling, and dark chocolate icing, Oreo pieces, and white icing on top. I was waiting to taste either an Oreo or a cookies and creme flavor, but this just tasted like a regular creme-filled donut with chocolate topping. 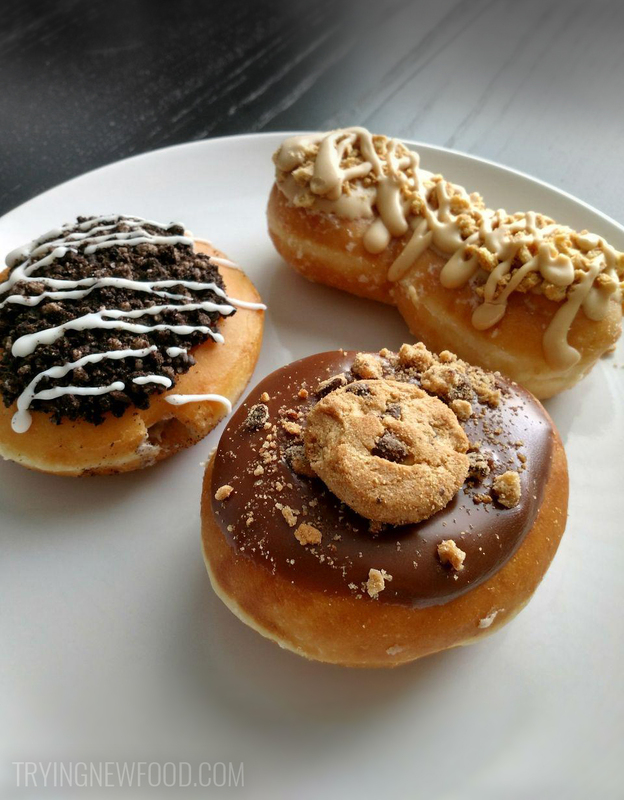 These three limited edition donuts were pretty much what we expected. They were all extremely sugary and cookie-themed. The Krispy Kreme Nutter Butter donut was decent. But overall, we really didn’t like them. I wouldn’t order any of these donuts again. I do like having fun limited edition options because it always makes things interesting. Between April 23-29, we’ll try and stop over to get the Lemon Glaze donuts which are only going to be out for a week. What’s your favorite donut to order from Krispy Kreme? Also, do you write it as “donut” or “doughnut”? Krispy Kreme chooses “doughnuts”. I prefer “donut”.